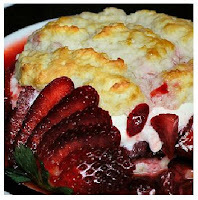 Here's a melt-in-your-mouth strawberry shortcake recipe from a cookbook called New Orleans Food by Tom Fitzmorris. If you don't have this book, it is a great one to add to your cookbook collection. This recipe is quite easy to make and doesn't take all day to complete. If you love strawberries like I do, I think you'll enjoy it. Mix in the butter with a whisk, cutter, or by hand until the flour resembles coarse cornmeal. Carefully add milk to the mixture until the consistency is thick, moist and even. Using an ice cream scoop, place mixture onto greased baking sheet, with the scoops about an inch apart. Bake at 475 degrees F for 10 – 15 minutes until lightly brown. Mix the corn starch and water and put in a saucepan. Add all the other ingredients and bring to boil, then lower heat and simmer for 5 minutes. Put sauce in fridge until thoroughly cooled. Slice strawberries however you like, and sprinkle with sugar. Refrigerate strawberries in a sealed container. Make whipped cream by combining the cream and sugar in a chilled bowl. Beat with a mixer until stiff peaks form. Slice shortcake in half and place one half on a sandwich plate, cut side facing up. Add some sliced berries and a generous dollop of whipped cream. Holding the top half of the shortcake over the plate or the sauce bowl, spoon some sauce onto the cut side, and place on top.